• One of a kind. Each blanket is totally unique! 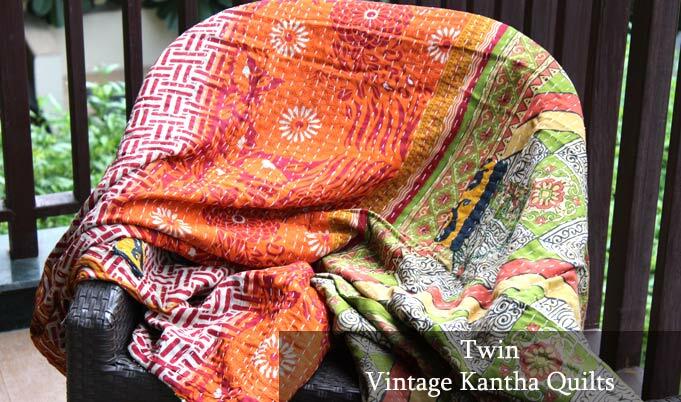 Shop Heavy Three Layered Best of Our Kantha Quilts. Shop variety of our Handmade Colorful Kantha Cushion Cover. Shop high quality Kantha Bags from Tote to Clutch. Shop for warm, cozy and comforting effect to bedroom interior with Kantha Bedding. Shop splendid Kantha floor pillow handmade in streets of West Bengal. 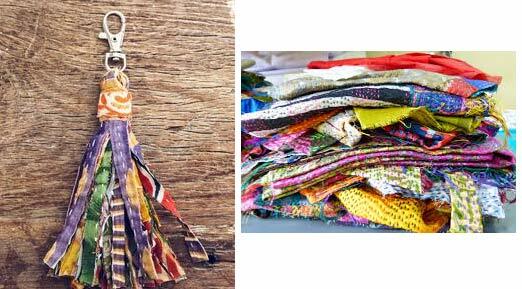 Shop unique packages of Kantha scraps from Vintage Quilts and Nee Fabric. These Vibrant Kantha Quilts Are Hand Stitched With Colorful Thread By Rural Women Of West Bengal In India, Who Spend Hours Creating These Wonderful Pieces, Each One-Of-A-Kind. 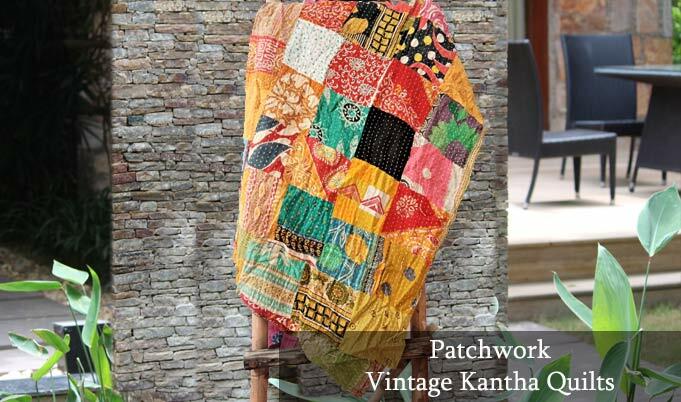 These Beautiful Quilt Have Been Hand Sewn Together Using Tiny Embroidery Stitches Known As ‘Kantha’. This Fine Stitch Is To Give Them Unique And Exquisite Look. Crafted To Provide Utmost Comfort, This Exquisite Quilts Are Reversible In Nature And Can Be Used From Both The Sides. Each Side Has Different Look Which Adds An Extra Charm To Their Beauty. Thus These Quilts Redefine Luxury and Ensure That the User Feel Warm and Comfortable After A Tiring Day. 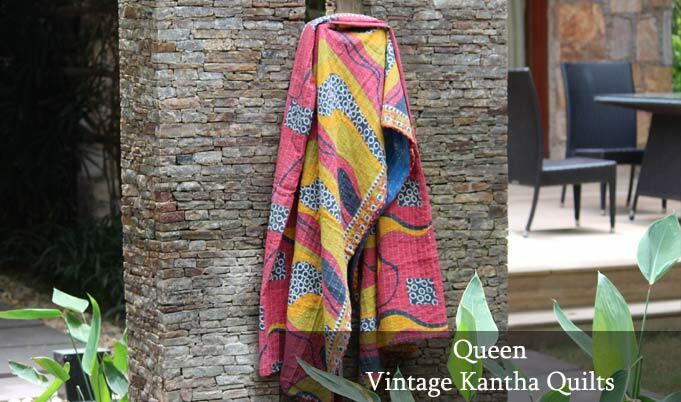 These Kantha Throws Are Made From 15-20 Years Old Recycled Fabric. Women In Rural Part Of India Use Fabric From Their Favorite Sari And Sew Layers Together With Colorful Threads To Give These Vibrant Look. As These Are Vintage Items They May Have Patches And Slight Imperfections. These Are Considered As Part Of Charm. The Entire Quilt Is Hand Embroidered With End Number Of Straight Stitches To Create A Unique Product. This Beautiful Embroidery Is Done By Tribal People Of Rural India For Their Livelihood. A Woman Spends Hours On This And One Quilt Takes 12-15 Days To Complete. Each Piece Is Unique and Has Different Pattern and Color on both the Sides. 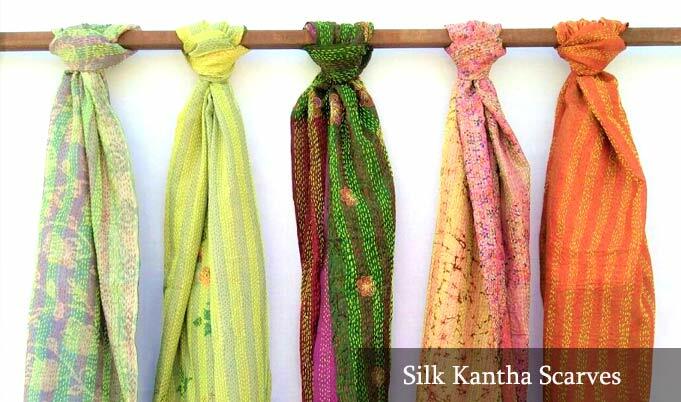 No Two Kantha Can Be Made Exact Same. Made From Finest Quality Fabric For That Extra Soft Feel, These Quilt Promises To Keep The User Cozy All Night Long.to make a type specimen book. These Kantha Blankets Are Multi-Purpose and Can Be Used As – Blanket, Sofa Cover, Quilt, Bedspread, Beach Throw, Couch Throw, Rug, Wall Hanging, Gypsy Caravan, Baby Play Mat, For Pets and A Perfect Gift For All Occasions: Weddings, House Warming, Starting College, Birthdays Etc.